Random event, can`t be reproduced reliably. It tends to happen with lower tier BB`s, especially New York (for whatever reason). 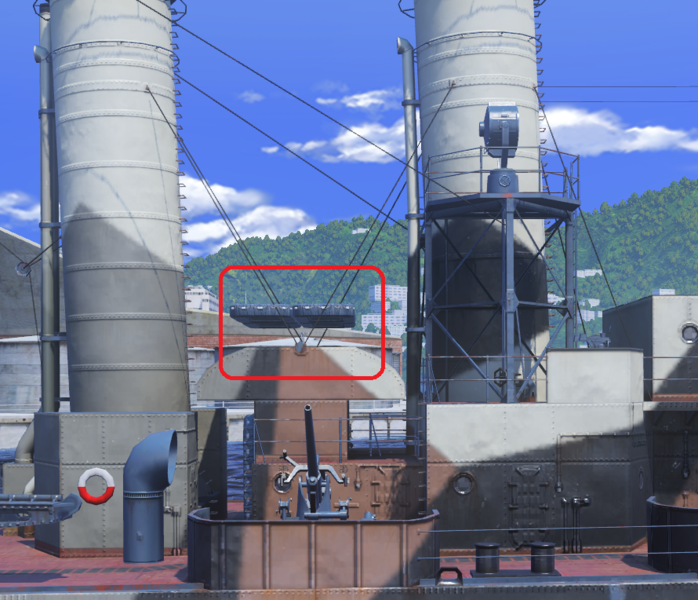 Visually it`s the same as torpedoes passing under DD`s - which was apparently fixed in 0.7.2. Collision engine loses it during ramming at borders. Either rammed, or ramming ship may become a submarine, get lifted out of the water, or even fuse together with the other ship. time to time, i get not kill, for clear me alone the ship destroying . 1. On Sleeping Giant map remain spotted behind island on E1-F1 even when it shouldn't. 2. Played Ranked battle in Zao. Tried to hide behind previously mentioned island. three enemy ships were close but behind the island. 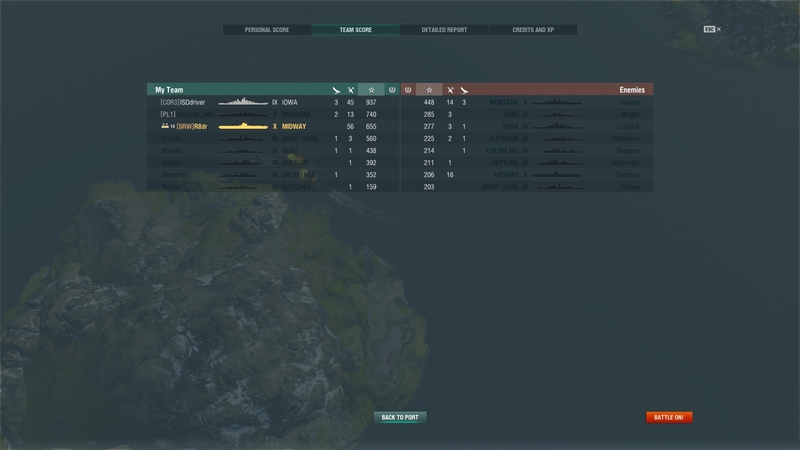 Clan mate of mine had the same issue playing Ranked battle in his Montana. 2 ships behind island, one in smoke. Shouldn't have been spotted but still was. 3. Be spotted even when you shouldn't. 4. Be unspotted when hiding behind the forementioned island. 5. 07/04/2018, around 15.00 CEST (clan mate about 1h later). Did you make sure the enemy did not have the assured aquisition skill? 3) Results: False hopes - was I miraculously gifted a T8 somehow!? 4) Expected Results: Nothing should happen. In the screenshot we can see 3 ships, while it says you have 11. 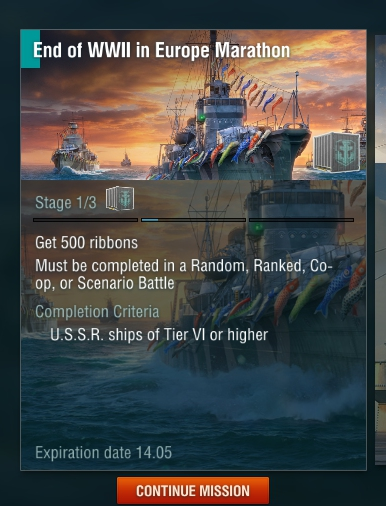 Are you absolutely sure none of the other 8 are tier 8? Also - Target Acquisition Mod? Or maybe top of your mast poking above the island? 1. 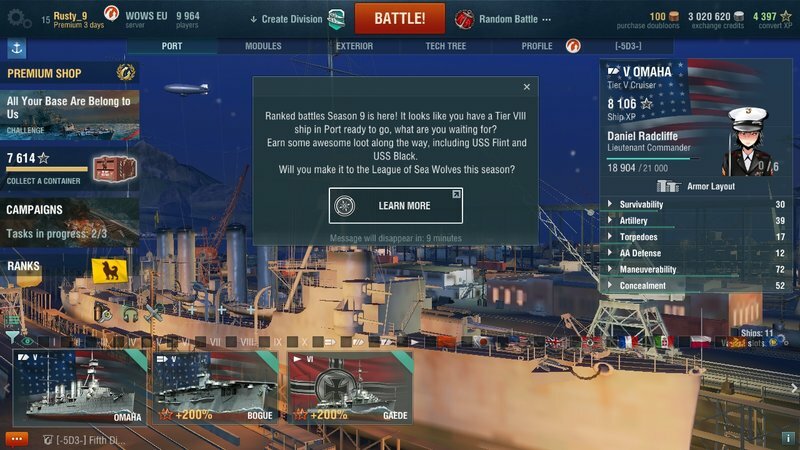 No status screen after battle: Happens when I finish a game and while in that game another one that I exited before end finishes as well (got sunk and exited to port, started a new game with other ship). I can access the battle stats via the notification window, but I get dropped straight into port after the last battle ends. After exiting the client and logging back in, the display is correct. 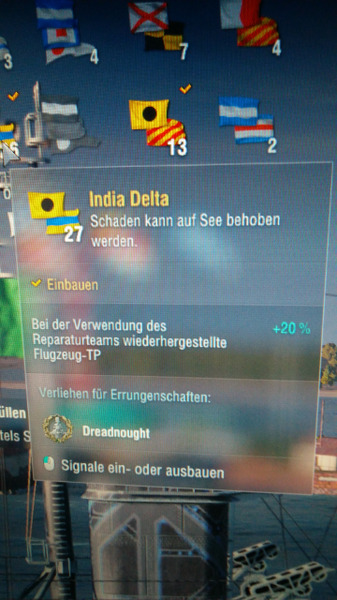 With last update Midway lost a number of planes, now it's 67...so what's wrong with this picture? It's from a few minutes ago in coop. Bots not affected by the change or what? So just had a game. Some guy honked he's horn just as the game ended and the sound stayed with me to the port. Had to restart to get rid of it. Yeah sorry my bad, saw 67 AA mounts, but it still doesn't seem to add up with all the float planes. As of 0.7.4.0., in combination with the "Advanced HP bar indicator" from the Aslain mod pack, the number of fires on your ship is no longer indicated on the HP bar. I'd post this on the Aslain forum but they can't be bothered to send me that registration email. Also while we're at it, the BADoBest over target markers display the ship name in red instead of white, which is super hard to read. Contrary to the description pic. When 'zoom out fully when battle starts' setting is checked, the camera is not zoomed out fully when a battle starts or when switching back to guns from torpedoes. The zoom level is instead set to one click of the mousewheel away from maximum. Just start a battle. When mousewheel down after it starts and you'll find you weren't zoomed out fully. Inconsistent zoom levels occur during the battle, which is distracting and may affect aim and awareness of conditions immediately surrounding ownship. Original zoom level chosen before to be resumed when leaving torpedo launch view. Automatic zoom out at start of battle to actually be maximum when the setting is enabled. An automatic zoom out (to the not-full extent it goes, see previous bug report in this post above) occurs regardless of whether 'zoom out fully when battle starts' setting is checked or not. Uncheck aforementioned setting, then start a battle. Camera is zoomed out automatically regardless of how you manipulated it in the pre-battle countdown. 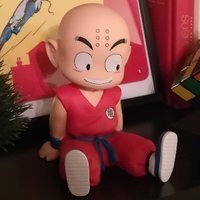 Camera position not to be modified on battle start. 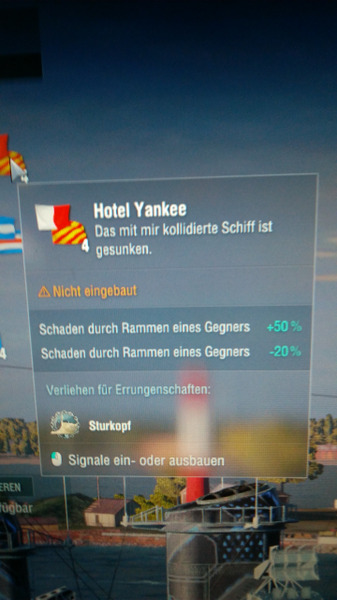 Below are confusing explanations for flags in the German version. First one talks about restored plane-hp for the India Delta flag, when that should be ship hp. Second one contains two identical descriptions for modification-flag for ramming. First should be +50 for the enemy, second -20 percent for own ship. Frequent crashes during the middle of the game when making a rapid maneuver or taking the first shot of the game. Mac OS. VERY frustrating. Using filters in the port for selecting various kinds of ships. But Alabama ... still in selected ships, even if tier VIII or BB not selected ! E.g. you select "Pan-Asia" & tier VI, and the following ships displayed as selected: Huanghe, Alabama, Fushun, and Anshan. Really annoying (.. even if I like to play Alabama). I had another crash too. Happens infrequently but always when there's action.. Get spotted, turn and aim rapidly, or this last time get spotted, launch torps, get hit by a salvo while speeding up to get away. Crash is that screen freezes, and windows beeps when pressing buttons. In windows it says something unexpected has happened and the program had to close. I'm not that inexperienced. Yes I checked the distance. The closest enemy was a Z-52 at about 4km on the other side of island whose hydro expired about 30 seconds earlier. They also did not have any radar ships in the vicinity that could have spotted me with their radar. I carefully checked all possible parameters that could have been a factor of me getting spotted. The only one I'm not sure about is the height of the island but from experience I know ships can indeed hide behind the island in question. Until this occurred of course. I think I answered there, but in case, if you have audio setting set to Ultra, try to set it to high and check if the crashes decrease or dissapear.